The first speculative industrial unit at Eshton’s Burnley Bridge Business Park is now under offer, just a week after the £50 million scheme was launched by Secretary of State for Business Innovation and Skills, Vince Cable. 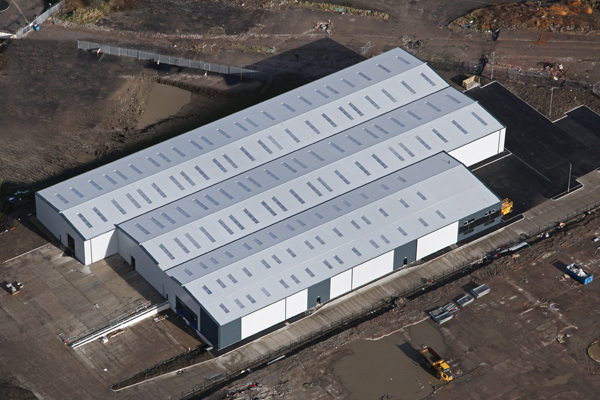 Providing 64,100 sq ft of manufacturing/warehousing space with extensive loading areas, the Cobalt Building is one of four speculative buildings constructed as part of phase one at the 70-acre site, with the help of a £3.85m ERDF (European Regional Development Fund) grant. The property which is BREEAM very good rated, includes flexible office accommodation designed to enable the occupier to extend the office provision or reconfigure the space to meet their specific requirements. Details of the purchaser and the purchase price for The Cobalt Building have not yet been released, but Eshton is expected to make a further announcement when the deal has been completed. Other speculative schemes included in the phase one programme are the recently completed blocks A & B at ‘Magnesium Court’ with a further 10,000 sq ft to be added later in the year. It is first speculative industrial space in the region for six years and now offers units from 3,000 to 19,000 sq ft. The remainder of the scheme will be developed to occupier requirements, making Burnley Bridge Business Park a tempting option for businesses looking for space up to 700,000 sq ft.